The KIMconference is one of the most important knowledge transfer events held in Spain. An event to discover and share new ideas about innovation, financing, commercialization and internationalization, among many other topics. In this issue we will discuss how to make tangible the great efforts in research, with a first block of political proposals for the next term (how do we take the technological advances to the ordinary citizen?) What initiatives do the political parties propose? practical application? Should they have it? …) and a second block with examples of projects that materialize this innovation (based on the new transectoral economic opportunities offered by fusion energy). We will also have presentations from experts, recognitions to innovative trajectories and a very productive networking. Excelent location Take advantage and discover Barcelona! Watch the vídeo! In this edition we discuss the different models of collaborative networks that exist in innovation. We delve into innovation ecosystems: collaboration between large companies and startups, intrapreneurship or new models of collaborative economy to answer questions such as: What are the challenges of the connection between key entities in innovation? What problems should we face in the collaboration between start-ups, large corporations and universities? What tools and initiatives are the actors of this ecosystem implementing for the initiatives of the workers? 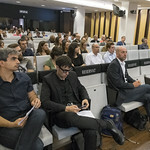 It was an informal day, with a more dynamic format than in previous editions, in which participation was intended to be one of the most important axes of this event. The KIMconference was transformed into a community of search for trends and sources of innovation training, which allowed us to transmit good content and learn from experts from various sectors, expanding our collaborative network. In the 2017 KIMconference we discussed how the disruptive innovations that they intuit in the horizon of the next years will affect our society, focusing on three important topics: Robotics and Industry 4.0, ‘Intelligent’ materials and innovative business models. If you missed it, in this section you can find a compilation of the best images, lessons, posts … that the event has left us. We’ll see you next year!